Suzuki started what may be his final spring training with a two-run, two-out single in the third inning Friday of the Seattle Mariners' opening 8-1 win over the Oakland Athletics. The Cactus League opener, delayed a day by Thursday's rainout, was between the teams that meet in the season's opening series on March 20-21 in Tokyo. 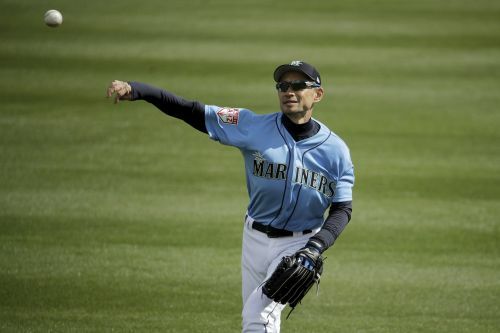 A 10-time All-Star who won the AL Rookie of the Year and MVP awards in 2001, Suzuki spent his first 12 major league seasons in Seattle, went on to play for the New York Yankees and Miami. then returned last season. He hit .205 in 44 at-bats before moving to a front-office role in early May. It long appeared Suzuki's goal was to play in the opening series in Japan, where he won seven Pacific League batting titles with Orix. He had a .311 career average in the North American major leagues with 3,089 hits in 18 seasons.